Celebrating its 31st anniversary, the internationally-recognized Hakuoh University Handbell Choir from Japan will be on Oʻahu February 18–24 for its 28th Goodwill Tour of Hawaiʻi, offering free public concerts. The choir will perform a range of selections from classical standards including Mozart’s “Turkish March” to contemporary hits from Disney’s Moana, such as “How Far I’ll Go” and the Hawaiian favorite, “HawaiʻiAloha.” The choir, based in Oyama City, Tochigi Prefecture, has the capacity to ring seven octaves of handbells, and their dedication to practice and performance has created worldwide demand for their music. The Goodwill Tour of Hawaiʻi includes a performance for friends of Hakuoh University at a friendship luncheon at the Japanese Cultural Center of Hawaiʻi‘s Mānoa Grand Ballroom. Hakuoh’s ensemble has performed in Canada, England and South Korea and has entertained audiences including the Emperor and Empress of Japan and the King and Queen of Belgium. 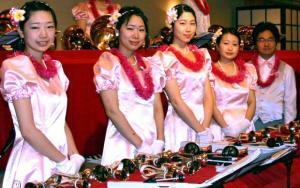 They have appeared at Disney World, Tokyo Disneyland and at the International Handbell Symposium in Australia. In 2018, Hakuoh University renewed an international cooperative agreement with the University of HawaiʻiCommunity Colleges. The annual Handbell Choir Concert, co-sponsored by Hakuoh University and UHCommunity Colleges, is one of the cooperative activities undertaken by the two institutions. For more information about the choir’s performances, call (808) 956-0321.